Trip Log – Day 397 – Ponte Vedra Beach FL to Jacksonville FL | How Will We Live Tomorrow? 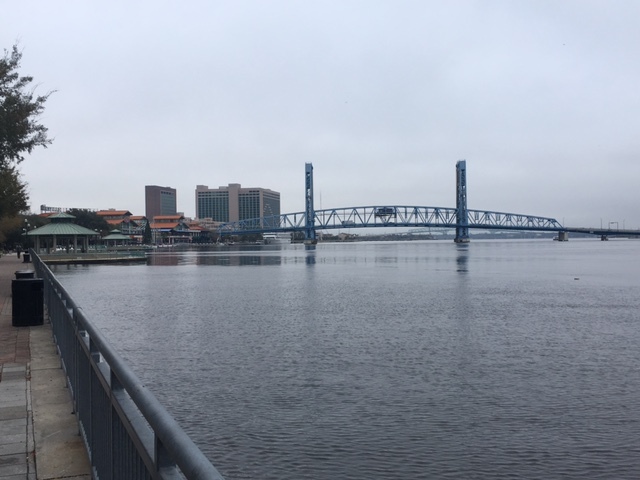 I rode into Jacksonville, the United States’ geographically largest city, on a busy Tuesday morning along miles of commercial strip along US 90 west, across a narrow drawbridge into downtown, and through the downtrodden neighborhood around Edward Waters College. The city is sprawling and nondescript as everyone along my Florida route warned. Poetically, I should have completed my journey in St. Augustine, our nations oldest city. But Jacksonville is more appropriate. It is not a city of the past, it is a city of our present, and as such will have greater bearing on what tomorrow portends. 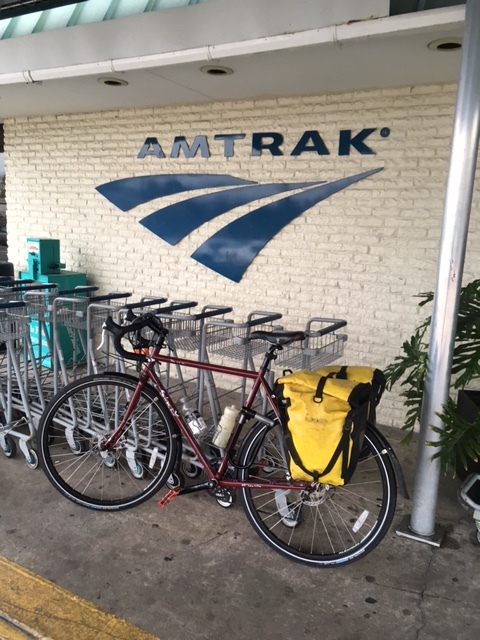 I arrived at the Amtrak station mid-morning, anchored my bike, and spent the day strolling the St. Johns River waterfront, eating Tuesday tacos and sharing a beer with old friends Jan and Mike Golan, who happened to be in the area for a warm weather break. After they dropped me off for my train, ruminations about my year plus experience began to fill my head. Oops, the conductor just called my train. Time to roll north into the deep dark of this longest night of the year until we reach tomorrow. All aboard! This entry was posted in Bicycle Trip Log and tagged Amtrak, Harn Art Museum, Jacksonville FL, Ron Garon. Bookmark the permalink. Congratulations Shorty!!! Glad Janet and I could share your last day on the road. It has been a privilege to follow you and see the country vicariously through your posts. Congratulations Paul! Your trip has been a great inspiration for me!